A hockey stop is basically a parallel turn into sliding sideways until you stop. The hockey stop is the most efficient way to stop, as it gives the maximum resistance possible as explained in creating resistance. This isn't to say though if you want to stop quickly you should just do a hockey stop, as there is a certain speed limit to which you do a hockey stop. This speed limit is not set, you just have to judge your speed with the conditions, and work out if you will be able to control yourself skiing sideways or not. If you are going too fast you need to put sliding turns (turns where you slide sideways a lot, losing speed) in to slow down until you are at a suitable speed. Below is a walk through explanation of how to make a hockey stop, assuming we are going straight down a slope, with the correct stance, and that we are going to turn right to make the stop, so that the downhill ski will be the left ski. From going straight down the slope, we put all our weight on the left ski to initiate the turn into the hockey stop. It is important to put all the weight on the left ski, as we want the ski to drop as quickly as possible, this makes us able to brake as soon as possible and creates as little movement across the slope as possible which would have given us extra speed to lose. Once we have all our weight on the ski, we let the skis turn, but keep our body pointing down the slope. This again lets us turn the skis more quickly as it is only the legs that have to change direction not the whole body, so it uses less energy. Once the skis have come to sideways we keep our body pointing down the slope but lean up the slope slightly to try and push the edges into the snow as much as possible. Depending on how fast you are going and what the snow is like, you will lean up the slope more or less. Then as we lose our speed and come to a halt, we bring our weight back over the downhill ski so that we don't fall over when we actually stop. Often when we do the hockey stop we actually take our weight away from over the skis, as the force from the skis resistance is strong enough that we have to take our weight away from over the skis to counteract it. As you get better at the hockey stop some weight can also be put on the uphill ski once you are sideways, to make you slow down even quicker. 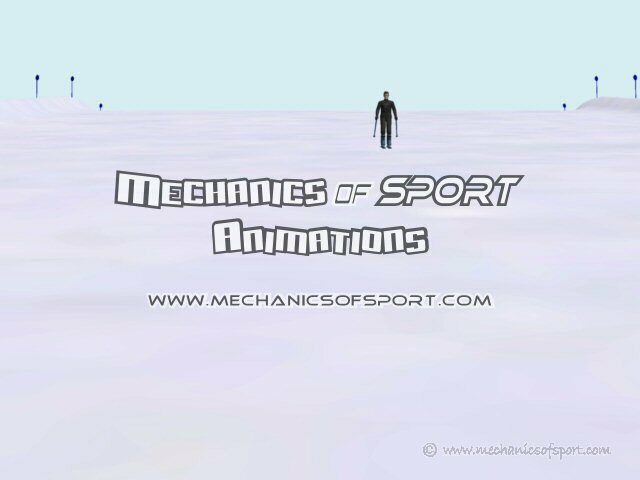 The animation shows the 3D skier doing a hockey stop from looking up a slope. Don't try to do a hockey stop from high speed and brake really hard, until you know your limits. Sliding sideways at high speed is quite different to normal skiing, and you need to learn what speeds you can cope with in different snow conditions. 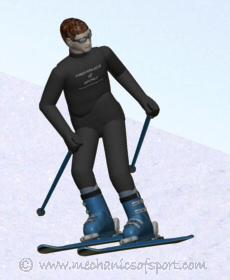 Taking ski lessons will introduce you to skiing exercises based on how people learn to ski in real life, so that you learn to hockey stop with the correct technique. On to the Pole Planting section.